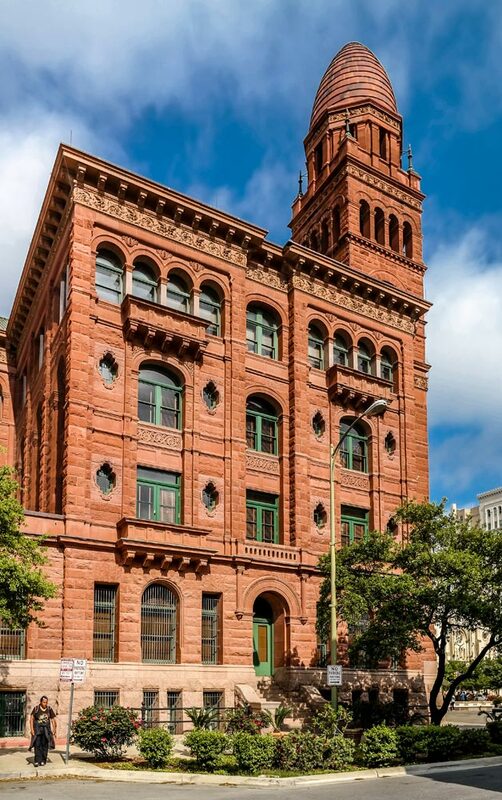 What was once two separate courtrooms with adjacent support offices and an intermediate floor separating the two, is now a grand two-story Commissioners Courtroom, restored to its original 1896 creation. In addition to the courtroom restoration, a new stairwell spanning five floors within the courthouse was designed to bring the building up to code. One of the challenging requirements to this courtroom is that it had to serve multiple uses in order to make the room more accommodating throughout the year. This courtroom primarily serves as the Commissioner's Courtroom, but can also accommodate high-profile trials as well as private social events and banquets. To facilitate this, the Judge's Bench floors are designed to be operable and can be electronically raised and lowered depending on the event. Due to a lack of plenum space and exterior perimeter walls, an energy efficient variable refrigerant flow system was designed into the balcony structure and provides the entire room's heating and cooling needs.